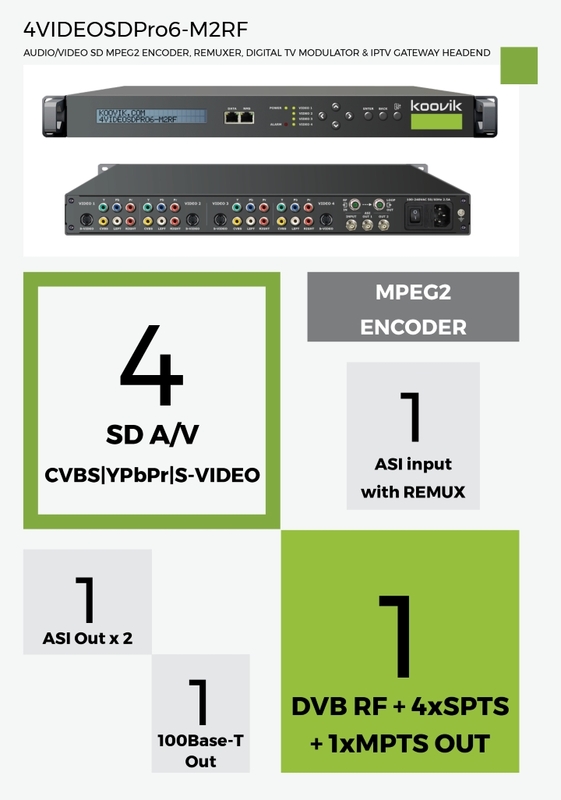 Professional-grade SD (Quad-A/V) MPEG2 encoder. ASI Multiplexer, SPTS/MPTS IPTV Streamer, and digital RF modulator. CVBS, YPbPr or S-Video are user selectable for each of 4 inputs. ASI input with Multiplexer, PID filtering, and re-mapping. Local or remote set-up using front panel display and keyboard or embedded web server. BIT-RATE 1.0 Mbps to 19.5 Mbps. CBR or VBR. User selectable per each video input. IP MPTS 1 MPTS with 4 x AUDIO/VIDEO TS over UDP or RTP/RTSP REMUXED with ASI. Unicast or Multicast. ASI 1 x ASI ( 2 mirrored ASI outputs ). Equal to IP MPTS out. BNC 75 Ω female. network 100Mb 100Base-T Ethernet Interface. included 1 x mains cable, 1 x ground cable, 4 x A/V RCA to RCA cables, 1 x BNC male to BNC male.